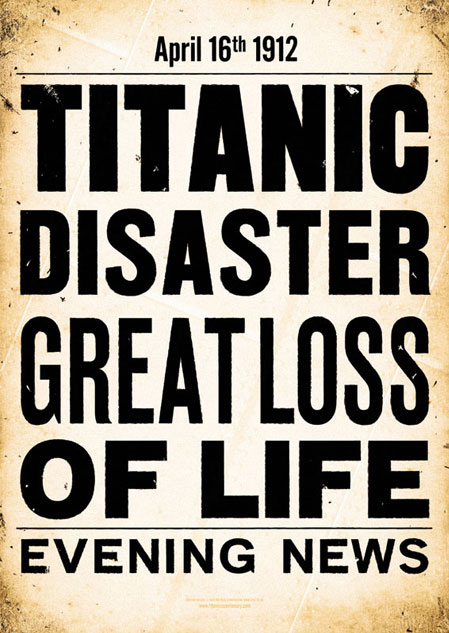 Description: A2 Coloured Poster created for the 99th Anniversary of the R.M.S Titanic. This piece is based on the old Evening News headline poster as held in the famous aftermath photo taken on April 16th 1912. In the photo the newspaper boy Ned Parfett holds an almost identical poster outside the White Star Line offices at Oceanic House in London. This piece was matched as closely as possible to an original that apparently still survives today and is finished with a ghostly digitally drawn rivet pattern in the background and hand drawn pencil aging effect. Poster prints available to purchase!